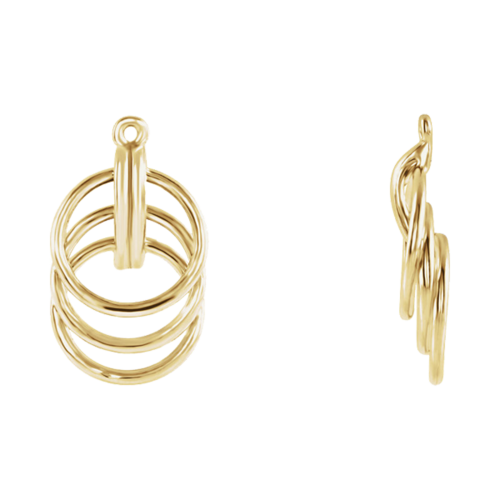 14k Yellow gold multi hoop style earring jackets. This pair of earring jackets measures 19mm by 7mm wide. Hoops are hollow tube design. Spunky addition to your favorite studs. 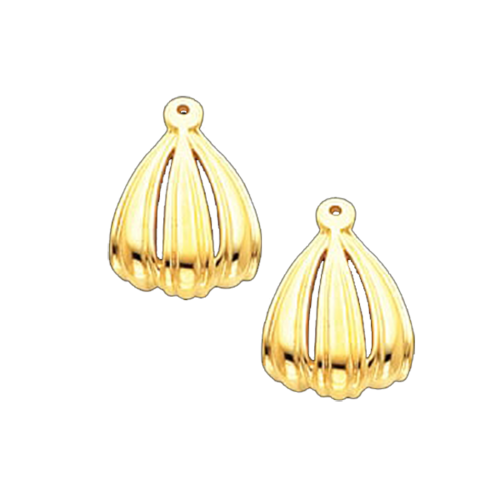 14k White or Yellow gold dangle design earring jackets. These jackets measure 27.5mm in length by 6.5mm across. Beautiful Gold Earring Jackets, Flowing Design, similar to a sea shell and sure to be a favorite in your earring jacket collection. 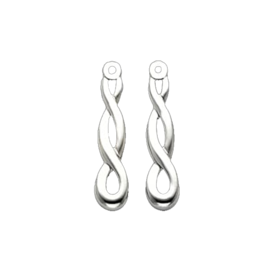 They are available in 14K Yellow or White Gold and measure 19mm x 13mm. 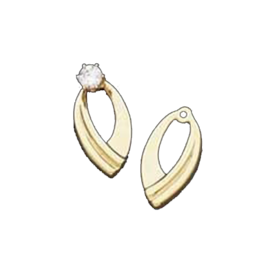 Add your diamond stud, pearl or gemstone earring, even a ball earring will look fabulous with this earring enhancer or jacket. 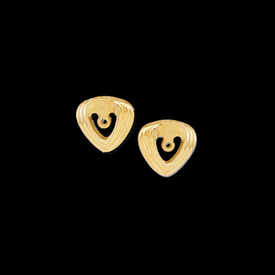 Dress your earrings up with one of our great earring jackets. 14K Gold Beautiful Ribbon Jackets measure 19mm x 12mm. Shown here with a diamond stud, a graceful jacket. 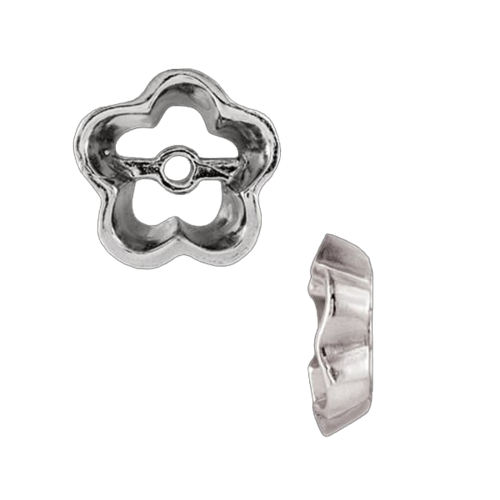 Available in 14K Yellow and Now WHITE Gold. 14k Yellow or White gold earring jackets. Very attractive jackets measure 17.25mm in length by 10mm across. 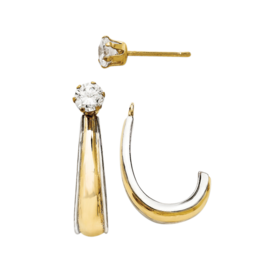 This earring jacket will work with just about any size stud and adds a bold look to your favorite stud or pearl earrings. Earring jackets are such a great addition to your jewelry wardrobe, allow you to change the look of your favorite studs. 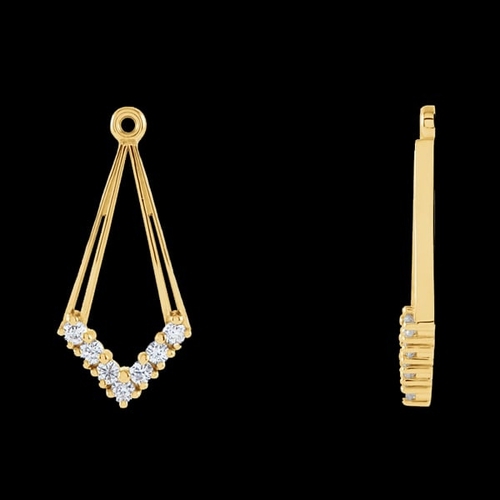 14k Gold Diamond Angle Earring Jackets measure aprox. 20mm x 10mm. Vibrant diamonds total .35ctw for the pair, SI 1-I1 clarity G-I color. 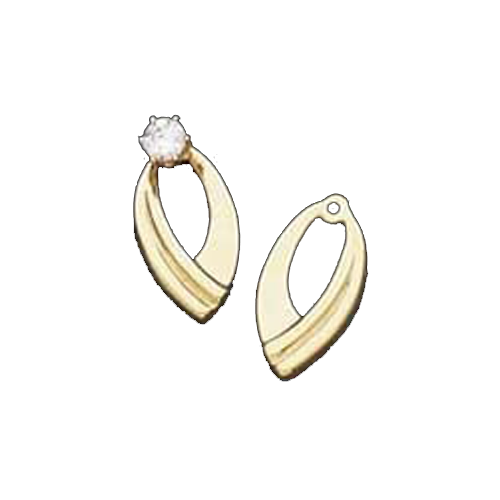 We have an incredible selection of earring jackets and diamond earring jackets. We're sure to have a set or two just right for you. 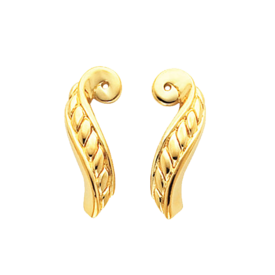 Beautiful 14k Gold, Yellow or White, Scroll Design earring jackets. These jackets measure 20mm in length by 14.25mm across. Gram weight 2.64. Will hold your 1/2ct. studs (1 ct tw). 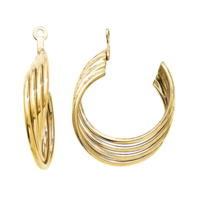 14k Yellow gold polished "J" hoop style earring jackets. 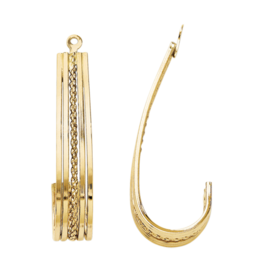 This pair of earring jackets measures 30mm in length by 6mm wide. Design features a rope center. Fun way to dress up your favorite studs. Pretty 14k Yellow or White Gold earring jackets. Jackets measure 18.5mm by 13.5mm. Great jackets for everyday or that special evening. 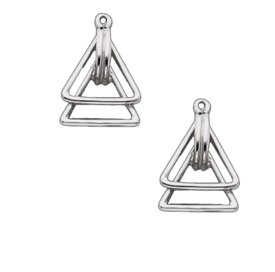 14k Gold Triangle earring jackets. 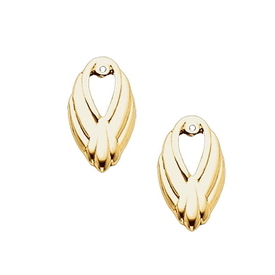 This dainty earring jackets measures 11.25mm by 12mm. Available in 14k yellow or white gold. Earring jackets turn your existing studs into a whole new look. 14k White or Yellow gold wide band hoop earring jackets. 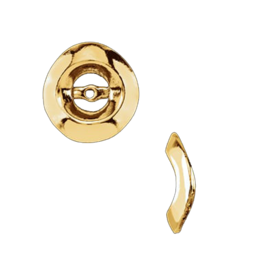 These earring jackets measure 20mm in length by 11mm wide. 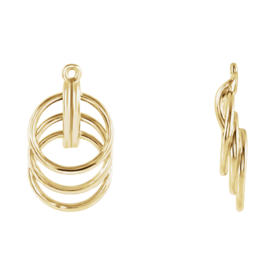 Hoop earring jackets are a great accent to your stud earring. Earring jackets weigh about 2.6grams. Great earring jackets for everyday wear. 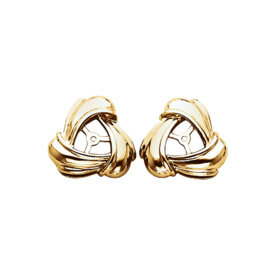 Lovely 14k yellow gold polished love knot earring jackets. 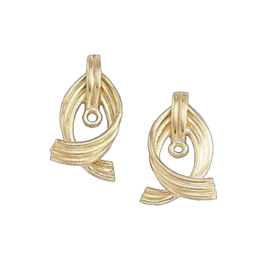 Our lovely gold love knots are a beautiful enhancement to your diamond, pearl, or gemstone stud earrings. Earring jackets measures aprox. 18mm in diameter. 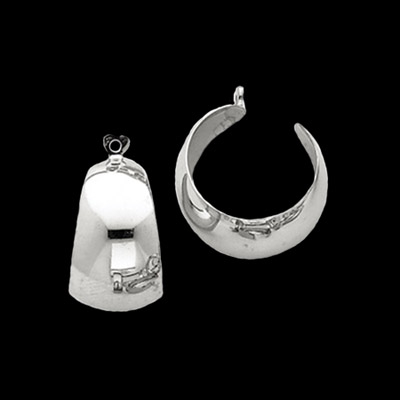 14K Yellow or White Gold Triple Hoop Jackets measure 21mm x 12mm. Nice earring jackets, our price is for the pair. Attractive 14k two tone gold J-hoop earring jackets. 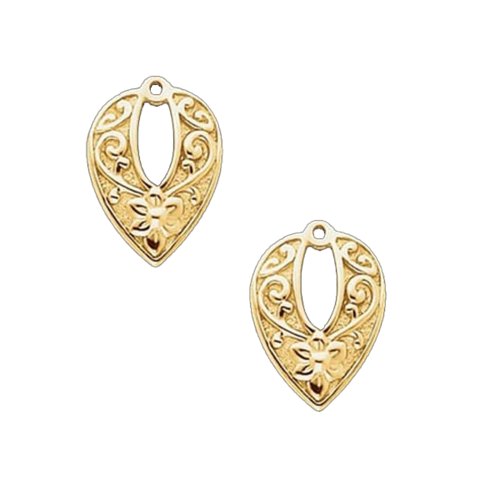 This pair of earring jackets measures 23mm in length by 5mm across at it's widest point. 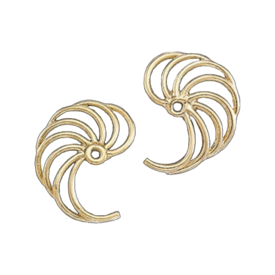 Great earring jackets for everyday wear. Marquise design earring jackets are available in 14k Yellow or White Gold. Jackets measure 18.5mm in length by 9.5mm across. 14k Gold Earring Jackets. Available in Yellow or White these jackets measure 15mm x 6mm and will hold your 1ctw pair of studs. 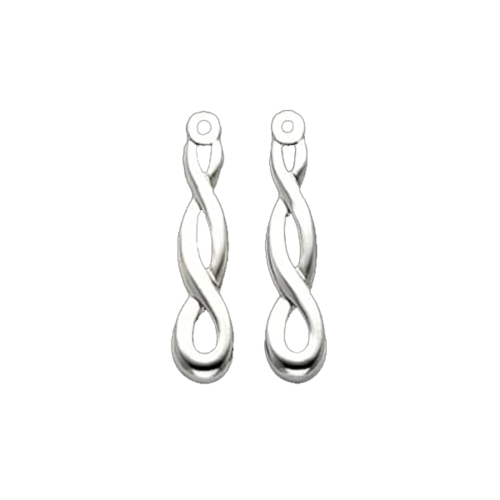 Earring jackets weigh 6.08grams for the pair. 14k Gold Swirl Dangle Design earring jackets. Order these in 14k Yellow or White Gold. 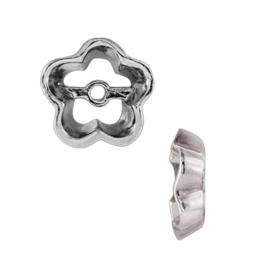 Earring jacket measures 23.25mm x 8.25mm. Will hold your 1ct tw pair of studs. 14K Yellow or White Gold Twin Triangle Earring Jackets measure 18mm x 14mm. An attractive pair of earring jackets. This earring jacket is very casual, wear it anytime.